Amazon may have struggled to get its “guarantee release-date delivery” Nintendo Switches out on time, but the good news is that once you have it, it’s pretty hard to destroy it. 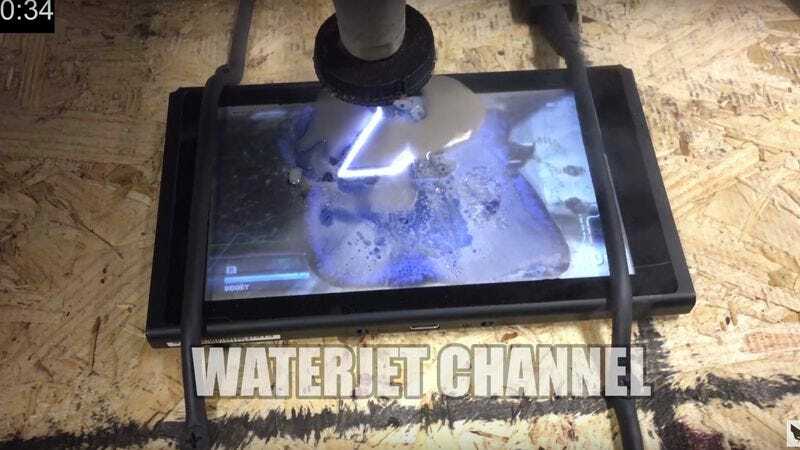 At least that’s what the gentlemen of the Waterjet Channel YouTube account discovered when they set about cutting into a Nintendo Switch with a waterjet, as is their purview. Only, rather than just comically marveling at the Switch’s destruction, they wound up proving that it’s pretty indestructible. The console does eventually die, of course, but not before the waterjet gentlemen carve a third of Zelda’s Triforce design into its screen. Even the hosts are shocked by how long the game keeps playing as they’re cutting into the device. And while they admit to feeling bad about destroying a brand-new, much-desired game console, their final design does look pretty damn cool. They sold the cut-up version on eBay and are also holding a free giveaway of a second, functional Switch, which you can enter right here. And for those more invested in the slicing-and-dicing portion of the video than its game-related content, the Waterjet Channel has all sorts of videos where they cut into everything from a mannequin head to a Rubik’s Cube.